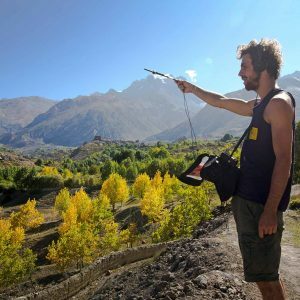 Musician, sound engineer and producer Nikò O’Brien has recently returned from the Himalayas where he was recording audio for Himalayas to Ocean, a fascinating programme highlighting how climate change affects the inhabitants of the Gandaki River Basin in Nepal. As the programme focuses on the human story, Nikò O’Brien wanted his interview microphone to be as unobtrusive as possible without compromising sound quality, while also being able to withstand the harsh elements they’d be subject to on the trek. For this he chose a DPA d:screet™ 4060 Heavy Duty Lavalier microphone, which was the ideal omni lavalier mic and also as a spot mic to record ambience. To capture more immersive sounds he used a DPA d:mension™ 5100 Mobile Surround Microphone because it was so portable and easy to use. In the interview below, Nikò talks about the project and his experiences with the microphones that travelled with him on this epic trip. What is your background in audio? Nikò O’Brien: I became interested in sound in my teens, growing up in France. I was playing in various bands and dreaming about how to record the (probably terrible) noise we made so that we sounded more like the bands that inspired us. I started tinkering with whatever machine or software I could get my hands on and trying to find creative ways to mic the whole band up (for example using old speakers as microphones). How did you get involved in Himalayas to Ocean? Nikò O’Brien: I grew up in a family that has always been conscious about environmental issues and I’ve tried to keep that in mind in my work. I think it’s particularly important in arts and the media as they are great vehicles for introducing new audiences to these issues and setting a good example. Wherever possible, I build kit from reclaimed materials, make use of solar power and always make sure I can fit my professional recording set up on a bicycle. Following on from the Record and Ride, I co-founded the three day Tandem music festival (http://tandemcollective.org/tandem-festival/) that engages new audiences and highlights social and environmental issues. While doing this I met one of the founders of the Himalayas to Ocean project and I immediately wanted to join in. Over the next 18 months the team slowly grew and we all mucked in to shape the project. The final team consisted of three graduates from the Oxford School of Geography (Alice Chautard, Yolanda Clatworthy and Justin Falcone) who between them shared the research, photography work and writing, a videographer (Ross Harrison) and myself on sound. Nikò O’Brien: Our main goal was to explore the human story of change, resilience and adaptation in one of the regions most heavily impacted by climate change in the world – the Gandaki River Basin in Nepal. Aiming to showcase the connections between upstream and downstream impacts, we split the journey up into three main sections: Flood plains, hills and mountains. The brief was to collect compelling stories of local people directly affected by climate change. We had various contacts and some fantastic partner organisation on the ground but before the trip we had no idea what these stories might be – we just wanted to meet people and develop a strong relationship with them to go to the heart of their experience of change. We had one month to do this so it was ambitious, but we came home with at least four coherent stories and many more to share with families and friends. Can you describe your journey and what that was like? Nikò O’Brien: For the first two weeks we had a driver who took us to our different stops. From there we either walked to meet our contacts and partners or drove, depending on distance. We were very aware we had a packed schedule, limited energy and had to be careful how we spent it. Between sound and video equipment, clothes for hot and cold weather and the usual trek supplies, we were carrying a lot of weight between us. Our trekking highlight was walking for four hours up and down hills to reach a community that had been cut off by road for a couple of years. At times the path followed the old dirt track but for quite a few sections we found ourselves trying to balance between two rice fields or scrambling up very steep stony gradients. With just under 20 kilos on my back, I was glad when we reached the village where we were greeted with flower necklaces. The last two weeks were spent in the mountains. We travelled in a small plane that could only take a limited amount of our equipment. I had already stripped my kit down to essentials, so only left behind silly things that I had accumulated along the way (bells, gongs, chimes etc…). For the following two weeks we had no driver and walked between stops. I very much prefer walking than driving so I was happy. Walking meant we felt more immersed in the environment and it gave us plenty of opportunities to capture some great sounds and shots. One of my favourite things about this part of the trip was the incredibly strong wind that developed every day. Although it made getting around hard, it also made everything sing! It was perfect: in the morning I could capture nice, delicate sounds and in the afternoon, with the help of contact mics and good Bubblebee Industries windshields, I recorded the sound of anything I could find going crazy in the wind. What were the biggest challenges in terms of capturing sound? Nikò O’Brien: I always find the biggest challenge is getting nice contained recordings. It’s incredibly hard, even in a small team, to make sure everyone is quiet whilst recording. Luckily there were no aeroplanes where we were and pretty much no traffic, but to get good, clean recordings I would often wander off or lag behind the group. However, I had to be careful to stay safe and not separate myself too much from the group as landslides are a daily occurrence in some places we visited and the routes we were taking were not always obvious to follow. Another challenge was having quick access to the appropriate equipment when you are carrying it all in one bag over long distances. I couldn’t have kept my recorder dangling round my neck for several hours just in case an amazing sound happened, so I would pack my sound recorder at the very top of my bag and use a tent pole as a stereo bar for my d:screet™ 4060 Heavy Duty omni mics, which I had plugged in at all times and attached to the outside of my bag. When I heard a great sound but didn’t have time to get everything out, I would just pull out my phone, which was connected to my Zoom F-8 via Bluetooth, then stand still and hit record. This also came in handy when I didn’t want to disturb a nice scene soundscape in a village by bringing attention to my mics. Another issue was how to capture a heartfelt recording without overwhelming the interviewee with gear. We decided from the beginning that keep the number of people present during interviews to a minimum, so I chose to use radio-packs for my DPA mics and when appropriate I would attach them to the interviewee then sit far back to monitor. This meant that once they’d eased into the interview they didn’t have me staring at them whilst waving a boom pole around their head. For the more ad-hock interviews I’d quickly attach a d:screet 4060 Heavy Duty to a tent pole and boom with that. It wasn’t perfect, but but it worked and was a lot less invasive than a shotgun-mic in a big windshield. Most importantly, it was very lightweight. Although I liked the strong winds they do make recording tricky, but luckily I was prepared and had brought along a bunch of Bubblebee Industries Windbubbles, which were life savers. I wish I’d taken more because by the end of the trip I’d managed loose or crush quite a few. I was also incredibly impressed by how well the wind cover for the d:mension 5100 performed. I was able to capture some great 5.1 wind sounds in some tough locations. Finally, humidity was a problem at times. Either it was hot and humid, or we’d get stuck in intense bursts of monsoon rain. I had dry-bags for everything but hadn’t anticipated the problem of getting rid of humidity once it got into the gear bags. Luckily the videographer had more experience of these kinds of environments and lent me some bags of silica-gels, so nothing got damaged and I learned a useful lesson about working in hot, humid conditions. Why did you decide to take a d:mension 5100 Mobile Surround Mic with you? Nikò O’Brien: For while I had been planning to explore immersive sound recording in the field and in the lead up to the trip I tried a few arrays (I would recommend reading Michael Williams’ work on stereo and multi-channel recording). However, they all involved carrying a lot of extra bits and bobs around. Then I was offered the opportunity to try out the d:mension 5100 and I quickly realised it was exactly what I was looking for. It’s all very well to spend hours in the studio fine tuning your multichannel array but when you’re out in the field you want everything to be as hassle free as possible. This mic was just perfect, and I can’t say that enough. I was able to stand on suspension bridges or in the middle of an active landslide recording in 5.1. It packed away easily in my backpack and within a minute I could be recording six channels of audio. It allowed me to push beyond what I thought was possible while recording high quality audio. One fun problem the microphone overcame was getting locals to chat, sing or perform. There were multiple occasions where I just set it up in a village and within minutes I had all the children singing around it! How did you use the d:screet 4060 Heavy Duty microphones? Nikò O’Brien: I also them for just about everything. They were great lavalier mics but I also used them for recording ambiences and sound effects, putting them in all sorts of silly places. As I described earlier, they spent a lot of time dangling off the back of my backpack as a stereo pair on a tent pole (inspired by a Wild Eye nature recording weekend I went to with Chris Watson and Jez Riley French) and I would also use the tent pole to boom them closer to the sound source. They had quite a rough ride but worked 100% throughout the whole trip from flood plains up to the dryness of lower-mustang. They were reliable, transportable and captured clean recordings, which is all you want when out in the field. I would recommend these for anyone planning a similar trip as I felt I could take risks I would not have taken with other microphones – and, of course, they also sound great (clean with fantastic detail). Now that this project is finished, what else are you working on? Nikò O’Brien: I am currently setting up a production company and recently ran a folk music recording residency where musicians from around Europe came together for a week to record an EP of traditional folk music produced in a more contemporary style. The d:screet 4060s made multiple appearances in the studio and I also sent some of the musicians out to collect found sounds with them. They enjoyed that – although I was a bit nervous! I am also hoping to use some of the recordings I made in the Himalayas for creative purposes, although I’m not certain what these will be yet. I am thinking of producing a short EP in surround inspired by and using sounds collected on this trip. Himalayas to Ocean is now being pitched to various distribution companies and it is anticipated that it will be broadcast soon.